Today is the first day after the last day of #SOL17. 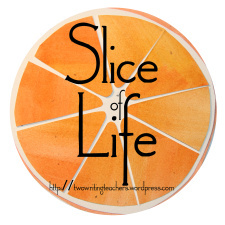 Making sure I linked my blog to the Two Writing Teachers website before the midnight deadline on the East Coast. So, about three-fourths of the way through slicing in March, I promised myself that I would continue to write every day. That I would blog every day. Even I can’t believe I made it! Writing. Blogging. Thinking. Relishing every moment. But, this is my weekend for writing progress reports. Shouldn’t I be doing that instead of writing rambling thoughts? And, as I think about writing every day, how will I come up with a fresh new writing idea for each day of the year? That’s 365 days of ideas! More to the point, where will I find the time and energy to keep writing every single day? I have a full-time job. But, this is the old me speaking. I feel different. I am different. Normally, I spend a lot of time thinking about what I need to do and precious little time actually doing it. This is a pattern that I know only too well. After I’ve made my lists – on sticky notes, on Google Keep, on my Notes app, or even on my Google Calendar – I am exhausted. There is so much to do!! Before I know it, I am overwhelmed. And, instead of getting busy doing, I find myself procrastinating. Not getting anything done. Finishing precious little. It’s the self-discipline that I crave. Writing every day may be the way to develop a habit of starting and finishing personal- and work-related projects. And, I’m showing up to find out.